An Action Hero is Born Hard. You know that irritating cliche: “rip-roaring rollercoaster ride”? Invented here: DIE HARD. The original and best. Action movie that carved a template for action movies – back in the day when even white guys could be terrorists. This close to being a pissant B-Action-Movie, DIE HARD is where TV’s smarmy David Addison transitioned to Being Bruce Willis. Lost the hair. Gained the muscle. Still smarmy. John McClane (Bruce Willis), a New York cop, arrives at the Nakatomi Tower skyscraper in Los Angeles, invited by his estranged wife, Holly (Bonnie Bedelia) to attend her company’s Christmas party and spend a few days (“Come out to the coast, we’ll get together, have a few laughs…”). Meanwhile, Euro Bad Guys are sealing off the building, dispatching the perfunctory ineffectual security guards, then crashing the Nakatomi Christmas party with their automatic weapons and Euro accents. Led by Hans Gruber (Alan Rickman, deliciously taking big bites of cheese), we discover these terrorists are after the Nakatomi vault. Everyone hostage. 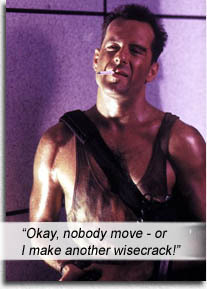 Except McClane, the fate of the hostages in his wise-cracking hands. 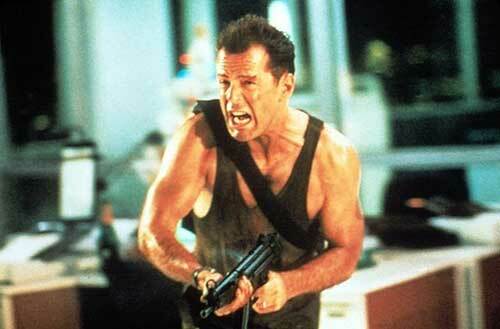 Thus is birthed McClane’s own brand of Everyman, sweaty t-shirt, fly-in-the-ointment action-heroing, as he avoids capture by shimmying through Nakatomi’s unfinished floors and elevator shafts, killing the terrorists one by one, throwing spanners into the Euros’ plans while blowing things up. During the siege, McClane allies with a beat cop on the ground via walkie-talkie, Al (Reginald Veljohnson), who can only talk in clichés. Paul Gleason, direct from THE BREAKFAST CLUB‘s (1985) detention room, is Police Chief Dwayne T. Robinson, and if he had his petulant way, everyone here would be in detention. What a scream! Hart Bochner brings the smarm like a smarm junkie on smarm steroids, sideways-mouth, fastidious beard, waggling head, pick-up-line ‘tude, smokin’ ego, coked nose, coming onto McClane’s wife… trying to smarm his way out of hostage situation. Ellis fails, pays the price. And Gruber’s albino sidekick (Alexander Godunov) goes hell-Euro to kill McClane, as does Gruber himself, to no avail. McClane is just too slippery and his wisecracks too juicy, to be caught. 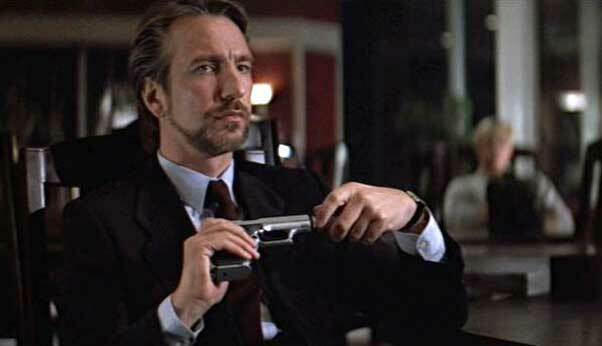 We find out that Hans Gruber’s takeover of Nakatomi is more prosaic than it would seem at first – they are not terrorists, just “exceptional thieves,” going for 600 million in Negotiable Bearer Bonds – until The John McClane happens. Though we would not realize it at the time, this first DIE HARD was thankfully R-rated, so the profanity and violence was at a premium. Though the action is all hyperbole, the offhanded swearing lends this piece a harsh reality when it comes to bad men and the Action Heroes who love to fight them – something which the makers of LIVE FREE OR DIE HARD (2007) sacrificed for a wider, younger, dumber audience. Writers: Roderick Thorp, Jeb Stuart, Steve E. de Souza. Starring: Bruce Willis, Alan Rickman, Bonnie Bedelia, Reginald VelJohnson, Paul Gleason, De’voreaux White, William Atherton, Hart Bochner, James Shigeta, Alexander Godunov, Robert Davi, Grand L. Bush.